And so it finally has happened. After several years of ignored warnings, with environmentalists dismissed as alarmist, the evidence is irrefutable. 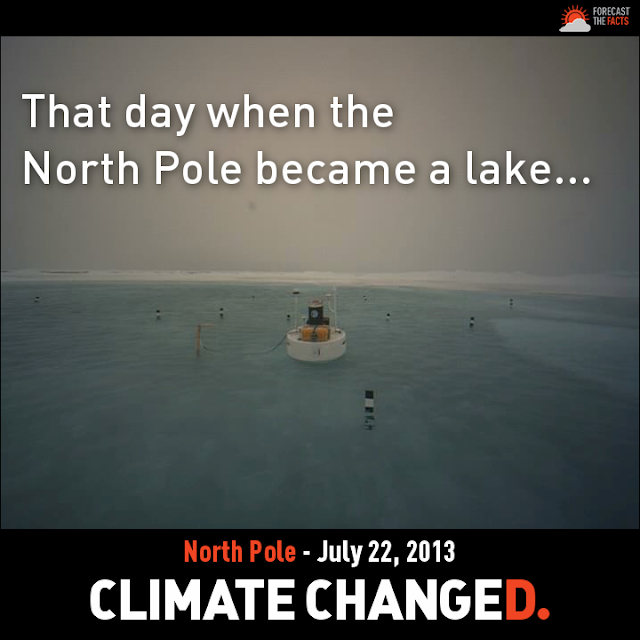 Unreported by a world media more interested in the birth of the Royal baby, the ice at the North Pole has thinned dramatically until water has burst up from underneath. As shown by the photograph below, from a permanent cam set up a the Pole, where once there was solid ice there is now instead a slushy lake. The clock is no longer ticking. The hour has struck. And still we close our eyes and party on. "Enjoy yourself. It's later than you think." A report this week has acknowledged that the increasing release of methane gases trapped for millions of years under now-melting permafrost in the Arctic regions may lead to significant costs to the world economy - $70 trillion, virtually the equivalent of a full year of global economic activity worldwide. The report by researchers at the Erasmus University in the Netherlands warns of the failure of governments, business and economists to take the impact of the methane melt into account in their typical, cold calculations of whether or not the world "can afford" to tackle global warming during the current recession. With the British Government increasingly seduced by the dirty fuel provided by fracking, in spite of the poison it leaves in the ground as well as the atmosphere, our headlong rush to put profit before people and planet continues. Methane is twenty times more damaging to the environment than carbon dioxide - the gas currently most driving man-made climate change. As carbon has warmed the Earth, the permafrost has begun to melt and as it does so, the potential for greenhouse gases in our atmosphere to rise exponentially with the release of millions of tonnes of previously trapped methane is alarmingly close. If it was all released, the amount of methane in the atmosphere could treble. And this is where the world economy, supposedly freed of the regulations that were a feature of most of the post-world war international settlement, is in a state of delusion. With neoliberal capitalism commodifying everything that exists (including the recent suggestions by the Chairman of Nestle that "access to water is not a public right" - his company needs to buy up a lot of it to help make their profits), the idea that the market will deliver the change in behaviour and habits that we need to save our way of life and maybe even our species is ever more surreal. The Dutch researchers hope their report will encourage bodies like the World Bank, the IMF and multinationals think for on its meaning and implications - by translating the message of environmental emergency into finance-speak. But it's not the first time this has been tried - remember the Stern Report? - and with many still hoping against reality and the mounting evidence around us every day that climate change is an issue for future generations, what chance is there that a system driven by profit will possibly stop what it exists to do and magically transform into something more benign? Even if some or many of the actors involved have a change of heart, the system itself drives people and corporations onwards on its profit-maximising, resource-exhausting path. If food harvests fall due to climate change, the price of food rises and profits and dividends rise too. Immoral? Of course, and many individuals in the Finance Sector would be as appalled at the prospect as much as anyone. But the whole point of a liberal economy is that, if the won't do it, someone else will - the money-making imperative wins. Only when it is constrained, regulated and even removed will anything change. We have already passed the point where a 2 degree rise in global temperatures is now inevitable - it may not sound much, but it will play havoc with global food systems, water distribution, extreme climate events and more. And at 5 degrees, an increasingly likely scenario by late on in the century our species will encounter conditions it has never before experienced - with huge swathes of the planet rendered uninhabitable, with all the conflict and disruption that will entail and, even more alarmingly, with the potential for air to ignite and hurl giant fireball storms across the sky. Solar Impulse - its not fuel as we know it. Air travel is often highlighted as a major contributor to the carbon emissions that are driving global warming. With humanity seemingly addicted to air travel which, in the absence of any serious aviation fuel tax anywhere on the planet, is also ludicrously cheap in comparison to less polluting travel options such as railways, the challenge of green air travel has always seemed elusive. While some airlines have dabbled in biofuel development and others have speculated on cleaner fuels, today has however seen a groundbreaking event which, although very much in its infancy, does offer the tantalising prospect that, one day, we may indeed have carbon-free air flights. 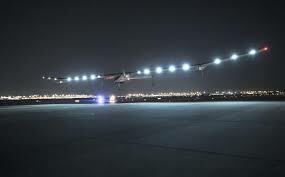 The Solar Impulse is an amazing aircraft - an aeroplane fuelled solely by the solar panels on its 63 metres wide wings, and it has just completed its first flight across the continental United States of America. Yesterday, it touched down at John F Kennedy Airport at the end of a two month journey. Its four propellers are powered by some twenty thousand fuel cells and the next challenge is to circumnavigate the planet. Developed in Switzerland by Bertrand Piccard and his team, the plane is internationally funded by a mix of private and public investment, and can fly day and night without needing any fuel. Obviously, it offers no realistic challenge to carbon-fuelled aircraft, for now. But with enough investment and time, today could eventually mark as seminal a moment as, perhaps, the Wright Brothers' flight on the Kittyhawk, or Bleriot's crossing of the Channel. In a world where traditional fuels are both damaging our worldwide environment and gradually become more expensive as they grew scarcer, the massive, overwhelming power of the ultimate source of pollution-free and completely clean energy, the Sun, as well as offering energy for our homes and workplaces, will provide a revolutionary new way of moving around our planet without choking it to death at the same time.